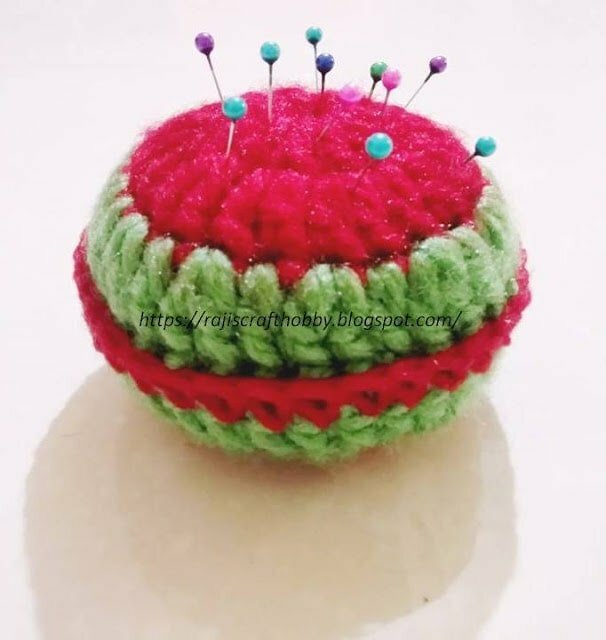 Crochet this Yummy Watermelon Pincushion with a free pattern and tutorial. Do you find yourself searching for needles, pins and stitch markers while in the middle of a project? ….Come …lets make the searching thing easy on us!!! !…….The best option….PINCUSHIONS…….yes… Pincushions are perfect for holding pins and needles so that you can get them easily when you need them and I do believe it is a must have for any needle crafter. Pincushions can be made of any fabric, felt or in this case yarn. They are typically filled tightly with stuffing, so as to hold your pins in place. For this pincushion I have used fiber fill. You can use bits of scrap yarn, bits of fabric or cotton. Watermelon has always been one of my favorite foods. Hence it has also been a cute source of inspiration for some of my projects. So I decided to make yet another of my favorite fruit inspired project and came up with this Watermelon Pincushion. These can be made well in under an hour and are simple and easy to but make. Use them for yourself or these would be a perfect gift for any of your craft lover friend or loved ones.